There is positively no denying that I missed out on my family’s green thumb gene. The property surrounding my parent’s house sports the most gorgeous landscaping, with beautiful trees, beds of free-form flowers, and pots spilling over with lush succulents, but it’s hard enough for me to keep our grass alive. The problem is that, despite all of this, I love having live plants in the house. If you follow along on Snapchat, you might be familiar with my “Watering Wednesday” tradition. This system has been the only thing that allows me to keep our greenery looking, well…green, and today I’m sharing the handful of plants that have stood the test of time under my enthusiastic (albeit somewhat cursed) care. I’ve heard mixed reviews about Fiddle Leaf Fig trees. Some say they are tough to keep alive, and I have to say that I agree, but the secret seems to be routine. Our Fiddle Leaf Fig actually inspired my Watering Wednesday routine in the first place after I read somewhere that they tend to like the same amount of water the same day every week. I figured, if that’s the way to keep our Fiddle Leaf happy, maybe the same would be true for all of our plants. So far, the system has worked. I pour about two cups of water around the base of our Fiddle Leaf Fig every Wednesday, and keep him and his pot in an indirectly sunny corner of our living room. Although he seemed a little droopy right after the move last October (they really don’t like change), he seems to have bounced back. If you want to try this one in your own home, place the plant in one spot and leave it there, then give it the same amount of water on the same day each week. I bought a Parlor Palm in honor of our sunroom makeover back in January, and just love the tell-tale tropical vibe it gives off. The flourishing leaves and chest-height stature make this mini tree a pretty stunning focal point in any room, plus they are fairly cost effective plants to adopt, too. Follow the care instructions on the tag that comes with your tree, but ours seems to do well with the same weekly watering as our Fiddle Leaf Fig. 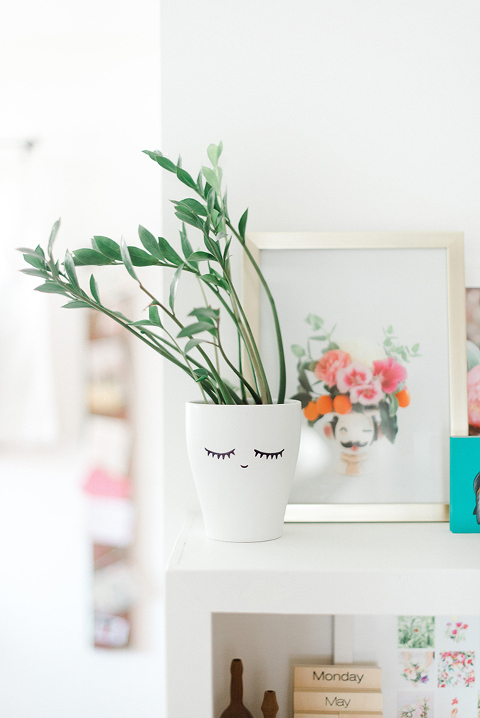 There might not be an easier plant to keep than a Philodendron. If I can do it, you definitely can, too. I think the secret to keeping this trailing plant happy is weekly waterings. I know I sound like a broken record, but this system has truly turned things around in our house. I used to be able to keep nothing but faux foliage around, but now with weekly care, our plants are staying green month after month. One thing I love to do with our potted Philodendron plants is manipulate the longer strands of leaves. We have one hanging in our sunroom near the window, and I just recently decided to gently twist the leaves around the curtain rod. Philodendrons grow surprisingly fast, so pretty soon, the curtain rod will be sporting neat living trim and a jolt of cool green color along the top. I can’t wait! Our master bedroom is in the very back of the house and only gets decent light for about two hours in the morning—and even then, it’s more of an indirect light than full on sun-shiny rays. Not wanting the space to be left out of our plant crusade though, I’ve been testing out a number of different varieties that can handle the lack of light. Only two have lived to tell the tale, and Dracaena is one of them. Again, weekly waterings seem to do the trick, but I tend to go a little lighter on the amount of water so as not to drown it where it sits in the shade. 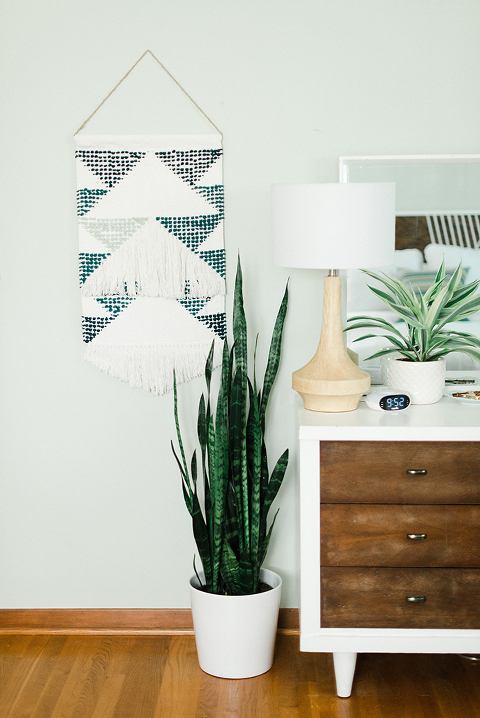 The second plant that has stuck it out in our shady bedroom is the Snake Plant. You’ve probably heard rumors that this is an easy one to keep alive, and the myth is true. It’s actually the only exception to my weekly watering rule since it seems to need next to no watering at all. I give it a tiny pour every couple of weeks and that seems to be all it needs. It’s the easiest plant I’ve ever owned (our particular potted Snake Plant is going on three years now! ), and doesn’t seem to care about being moved from room to room either. Do you lack a green thumb, too? What types of plants have you found to be the easiest to work with? 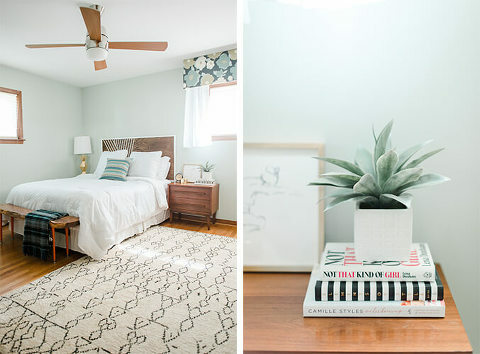 Do you have any tips for those of us who can’t even keep cacti or air plants alive (guilty!)? I’d love to hear your own advice, so leave your wisdom below in the comments. LOVE this post! (and my god your house is gorgeous). Thanks for the advice on the Fiddle Leaf Fig. I inherited one with the house we bought and it’s been on the brink of death many times before I’ve miraculously saved it. I will now institute watering Wednesdays. I never knew they were quite THAT finicky! 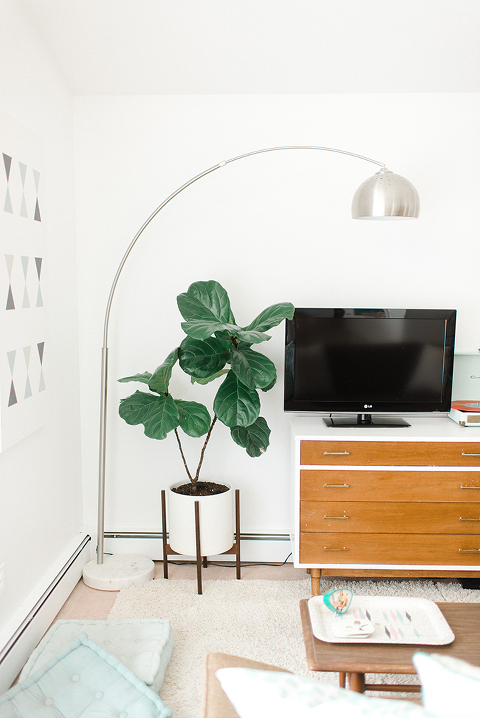 Do you know if it’s possible for an old, tall, spindly Fiddle Leaf to get full again? Mine is about 12 feet tall and has very few leaves maybe 50 total on 5 trunks. It’s looking pretty sad.